The Samsung Chromebook Pro skews a little too heavily towards being an Android tablet. Regardless, it’s a solid hybrid that brings us one step closer to the perfect marriage between Chrome OS and Android. It was only a matter of time before we would see a laptop finally utilize the convergence of Chrome OS and Android to its full potential. 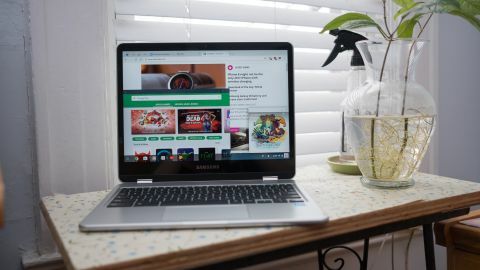 It goes without saying that the Samsung Chromebook Pro is that notebook, and its charm is only partly the result of its multifaceted set of features. That’s right. Here is a laptop that scores points not only for its fascinating emulation of Android apps found on the Google Play store but also for its unequivocally easy to understand design that knocks the vast majority of 2-in-1 laptops out of the water. There is no doubt in our minds the Samsung Chromebook Pro influenced the Google Pixelbook as well, what with its touch-heavy inputs and business casual presentation. Having said that, the Samsung Chromebook Pro isn’t without its faults (what laptop is?). We’ve determined this mainly on the principle that, in an attempt to appease both appease laptop owners and entice fans of tablets, Samsung has accomplished neither without foibles. Minding its pros as well as its cons relative to cost, let’s first explore your options. Our review configuration comes priced at $549 (about £440, AU$720), which is a smidgen more expensive than the $499 or £599 (about AU$650) Asus Chromebook C302 that earned our Editor’s Choice award. However, that extra 50 bucks nets you a sharper QHD 2,400 x 1,600 display, plus the built-in stylus, but half as much storage as inside the Asus Chromebook. Granted, that still makes it far more digestible than the aforementioned Pixelbook, which starts at $999 (£999, about AU$1,295), albeit with noticeably upsized specs. Meanwhile, the HP Chromebook 13, the previous frontrunner when it comes to cost, can be found for $599 or £729 (about AU$800). That one has a 3,200 x 1,800 QHD+ screen, but no touch support. For those that don’t need the all the processing power of an Intel Core m3 processor, the OB1 ARM chip-powered Samsung Chromebook Plus is also available for $449 (about £360, AU$590). Despite being a lower-tier model, the Plus retains its QHD display and other specs. Again, the Asus Chromebook 302 is its closest competitor, meeting it at the same $449 or £499 (about AU$590) price with an Pentium processor and 32GB of storage. For now it appears the Samsung Chromebook Pro has only been announced in the US, but we can't imagine that it won't be be coming to UK and Australia in the near future. It’s clear Samsung’s design for the Chromebook Pro centers around portability. Weighing in at a scant 2.38 pounds (1.08kg), this all-metal Chromebook is the lightest device in its class and a featherweight compared to most laptops we’ve ever used. While it’s lighter than the HP Chromebook 13, it can’t win the thinnest award with an 0.55-inch high frame that’s just five-hundredths of an inch thicker. Despite the extra fractions of an inch, the Chromebook Pro is one incredibly thin and light device that feels like it’s almost filled with air. But don’t mistake its lightweight nature for a flimsy laptop. The all-aluminum build of this Chromebook makes it sturdy and flex free. Samsung also went with all rounded edges and a softer metal that feels much more inviting to hold for long stretches than most hybrid notebooks. One key difference of our pre-production review unit, is the retail-ready model’s exterior should actually be jet black. We love the look of our silver unit and it only looks even more “pro”-fessional (if you will) with a darker paint job. Unlike many of Samsung’s other laptops, the Pro features a 3:2 display that you would more regularly see on tablets. You get more vertical pixels that makes it easier to view photos in fullscreen and read web pages at a glance, especially while holding it in a portrait orientation. Unfortunately, this squarer aspect ratio doesn’t jive with wide-screen video in 16:9 and 21:9 aspect ratios. TV shows and movies letterbox heavily, leaving you with thick black bars above and below the picture. One other unfortunate side effect of the boxy proportions it it ends up making for a cramped keyboard. Without the wide form-factor of a 16:9 screen, the keyboard has almost no room to stretch out, resulting in smaller overall keys, snipped shift keys, and – worst of all – a delete key that’s one-fourth of its normal size. It’s an uncomfortable typing environment, but one you can get used to after several days with the Chromebook. Still, during those first few days with the device, we had to backspace many accidental characters when we meant to hit that very backspace key. Key travel is disappointingly thin at about one millimeter at best, but they at least offer a bit of resistance and spring back up immediately. With a device as thin as this, though, we couldn’t ask for much more key travel than this. Unfortunately, this is also the only premium Chromebook that lacks keyboard backlighting. The trackpad is as serviceable as they come, with a plastic feel and accurate tracking. Without the numerous multi-touch gestures seen on macOS Sierra and Windows 10, you’ll only be moving around the cursor and clicking on things anyway. Samsung calls the Chromebook Pro a new class of device designed with the Play Store in mind. To this end, it comes equipped with gyroscopes and accelerometers we used to great effect to drive through courses in Asphalt 8. More importantly, though, this is the first Chromebook with a built-in stylus. As with Samsung’s Galaxy Note line, pulling out the stylus out of the side immediately gives you a few options to add a new note, take a screenshot or use the pen to direct an on-screen laser pointer during presentations. For writing and sketching, the stylus feels on par with everything we’ve used on Microsoft’s Surface devices – which is to say it feels extremely natural and precise. Samsung fine-tuned the friction between the glass and pen to make it feel like writing on paper. The stylus is also pressure sensitive, so pressing it harder against the screen will change the shape of your strokes. Chromebooks (and even our Pro model here) shouldn’t be as powerful as Windows slates to support digital pens as well as this. However, Google and Samsung developed software that reduces latency while using the stylus. Using the power of the search company’s cloud and machine learning technology, the two companies analyzed thousands of handwriting and artistic strokes to predict where the pen will go. All that predictive software comes baked into the Chromebook Pro, so don’t worry about Google logging your strokes or needing an Internet connection for a smooth writing or drawing experience. What’s more, you can save everything you pen to Google Keep, which then can scan your handwriting to create a searchable index. It’s an incredibly useful tool, and we’re more impressed it can actually make whole words out of our illegible chicken scratch.